Hanging so discreetly that you could miss it when first entering the gallery, So Alone (2012), a photograph of Carsten Höller taken by photographer Davide Monteleone, portrays the artist from above, surrounded by no less that thirty pairs of twins. It sets the tone for his show at Air de Paris, his first in the city for nearly six years. In With, an exhibition made up of collaborations, the artist’s singular authority, touch and soul get purposely lost, making room for other voices. In doing so, the show renews – more or less successfully – Höller’s exploration of the double, an idée fixe that has intermittently haunted his practice since the 1990s. The works presented here were made ‘with’, respectively, taxidermist Yves Gaumétou, model-maker Rigobert Nimi, perfumer Ben Gorham, unnamed twins, photographer Attilio Maranzano, artist Philippe Parreno, and architect François Roche. Höller is, of course, known for his participatory and playful artworks, and while Memory and The Memory Game (2012) might not be as exhilarating as his notorious slides and carousels, they can still make your head spin. The first work is a series of 30 reversible frames: on one side of each is a photograph, taken by Maranzano, of a different ride in an amusement park; on the other is a four-colour processing of the exact same picture, by Höller, that resembles a drunken version of the original. (In order to decide which side of the Janus-faced work faces the viewer, a member of the staff flips a coin on a weekly basis.) The second work is an actual and improved game of Concentration based on the Memory photographs: 32 double-sided cards left, with instructions, for the viewer’s sportive pleasure on a table in the middle of the room. This time, Maranzano’s and Höller’s pictures don’t correspond on both sides of one given card, so that one has to be doubly concentrated in order to find a pair. At the end when no card is left unmatched, the player who got the most pairs wins the game (that does not mean he or she can leave the gallery with the artwork…). The biggest surprise in the exhibition is Höller’s recent collaboration with Gorham: a collection of fragrant toothpastes, Insensatus Vol. 1 Fig. 1 (2013), to be commercialised in the near future and here displayed in a fancy walnut box. The package includes three flavours (‘Male’, ‘Female’, and ‘Infantile’) and a base toothpaste (‘Activator’) to blend them with before use at night; brushing with these promises – depending on your dosage – to influence your dreams accordingly. Finally, you may experience a definite thrill at the end of the show while venturing into the installation Hypothèse de grue (2013), made with Roche. 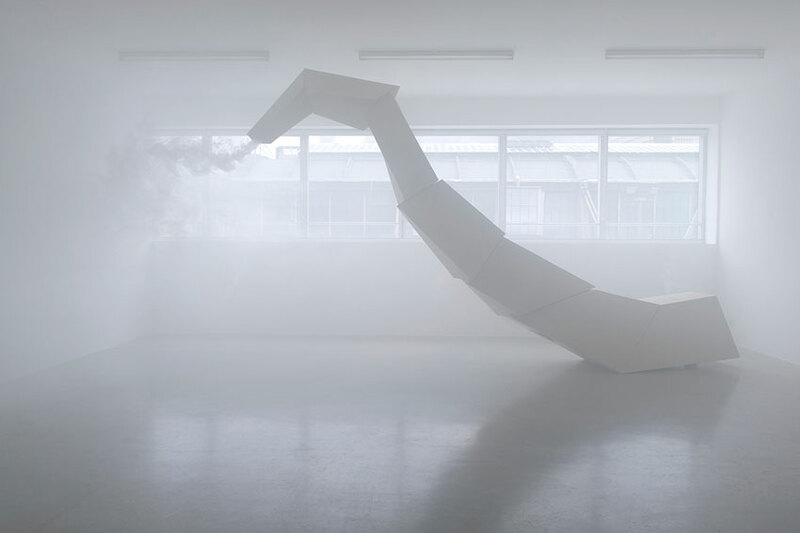 Rising high in the middle of the room and vaguely dragon-shaped, a white metallic structure containing a smoke machine releases a deep, blurring fog filled – according to a large wall caption that is impossible to miss before entering the room – with unspecified neurostimulants. This causes you to wonder about their effects and analyse your own behaviour: are these substances actually enhancing your mood in any way, or is your sudden excitement only due to the fact that the notice warned you to step back if pregnant or sick? The only certainty is that no spectator will be harmed – merely intoxicated but since you can’t tell, you can’t sue – in the course of Höller’s show.